Hundreds came. The Mayor of Charnwood was the guest of honour. <!- Events will probably centre on the Jubilee Park, but the procession will trace the walk, cross the Green and the old village. 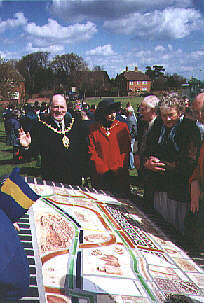 --> The Millennium Mosaic was unveiled on the Green at 11.30am. Here are some other things we did. Everyone was welcome to All Saint's church for an all-age service starting at 11am. The Mayor of Charnwood snipped the tape on our redeveloped shopping centre. Councillors and official will be there to answer your questions. After the ceremonies bring some 'finger foods' with you to the Church Hall for a shared lunch. Soft drinks, tea and coffee will be provided. Meeting at the Mosaic, collecting anentry card. Bringing the map and following the signs. The first 200 children to show a completed and stamped card won a chocolate egg. Last entries 3pm, last finishers 4pm. Well done Thorpe Acre! This is one of the best community projects for the Millennium in the county and I'm looking forward to seeing you when I open it on Sunday 16th April. I'd like to thank everyone who contributed and pay a special tribute to those who have acheived it, in particular Thorpe Acre Junior School, local Councillor, Max Hunt, naturalist and builder Roy Campsall, treasurer Lynne Atkinson, trailblazer, Mick Callaghan and Brian Skinner and Ken Howlett representing the church. We are now hoping to organise a number of walks from August 24th: suggested themes are: nature & wildlife, poetry, the history of Garendon Park, keeping active for the over Sixties, and so on and on!